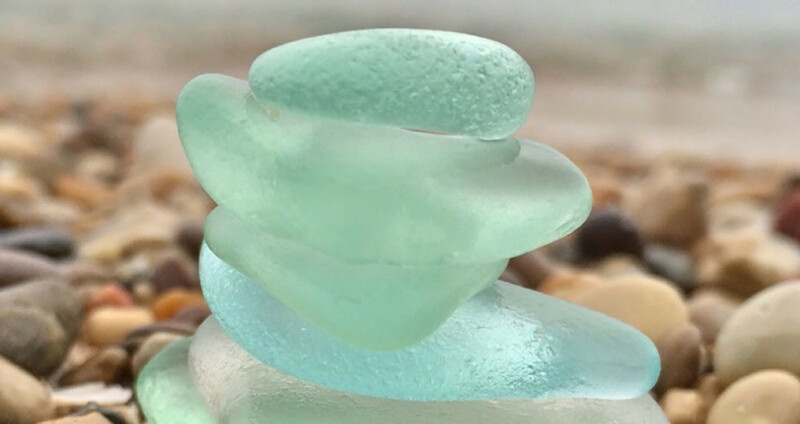 It was not the best day for a boat test—frequent squalls blowing in from the Atlantic, a high-seas warning offshore, skies spitting rain from billowing clouds, the landscape shades of gray. Not the vision of Ft. Lauderdale promoted by the Tourist Council. But inside the brilliant surrounds of the Okean 50’s main saloon, even this view was spectacular. I felt as if I were standing outside in the rain, but dry. With 360 degrees of crystal clear tempered glass surrounding the high-tech helm and saloon, nature became part of the interior even with all the saloon openings closed. Hard to imagine that this is a 50-foot boat. undefinedThe Okean takes full advantage of light ingress at every available opportunity. Transparency was not the feature of the boat that I came to write about, but it perhaps overshadowed even the unique pair of balconies that deploy from the freeboard, increasing the afterdeck space by a whopping 100% to a total of 228 square feet. Bow-on, the Okean looks space-age in its design and angularity. undefinedThe total effect is a modern-looking Mad Max aesthetic. You will no doubt see photographs of this unique yacht, but what is not always apparent in them is the complete openness of the main saloon. 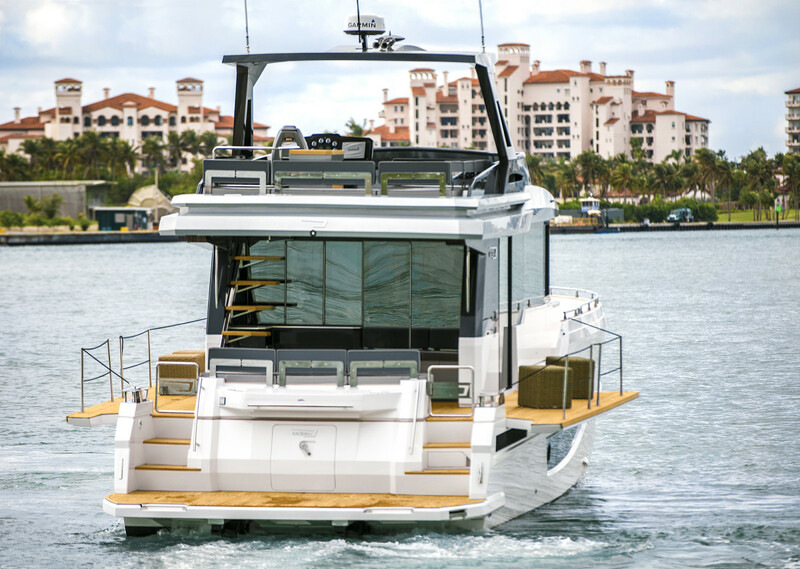 In addition to the wraparound “sea glass” views, there are sliding glass doors on the starboard side that disappear when opened, a double-hinged door to the afterdeck, and a large opening pass-through from the galley to the portside deck. When everything is opened and both balconies are deployed, you are surrounded by space. And all this only enhances what is a fairly spectacular saloon itself, one that contains an enormous settee, a finely crafted hi-lo table, an entertainment center, and a compact, efficient galley. The provenance of this unique vessel is an interesting story. It all began many years ago when Nercio Fernandes, a successful software entrepreneur in Brazil, cruised his new 37-foot boat from Miami to his home east of São Paulo, Brazil, a voyage of more than 4,000 nautical miles. 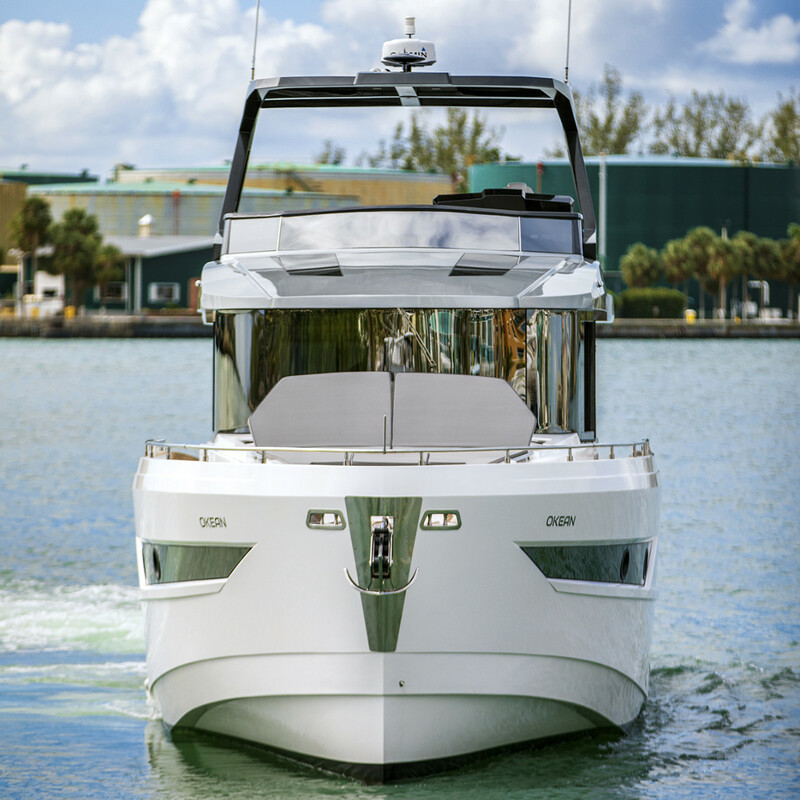 Fast forward to 2012 when Fernandes took delivery of a new 60-foot Princess from HMY Yachts in Miami. The hook was set. In 2015 he decided it was time to satisfy his dream of designing and building his own vision of a contemporary power cruiser. He envisioned the type and size yacht he wanted to bring to the market. It was to be of contemporary design, be capable of excellent performance at both displacement and planing speeds, and create a sense of openness to the sea. Yacht designer Paolo Ferragni worked with Nercio Fernandes to design the Okean 50. 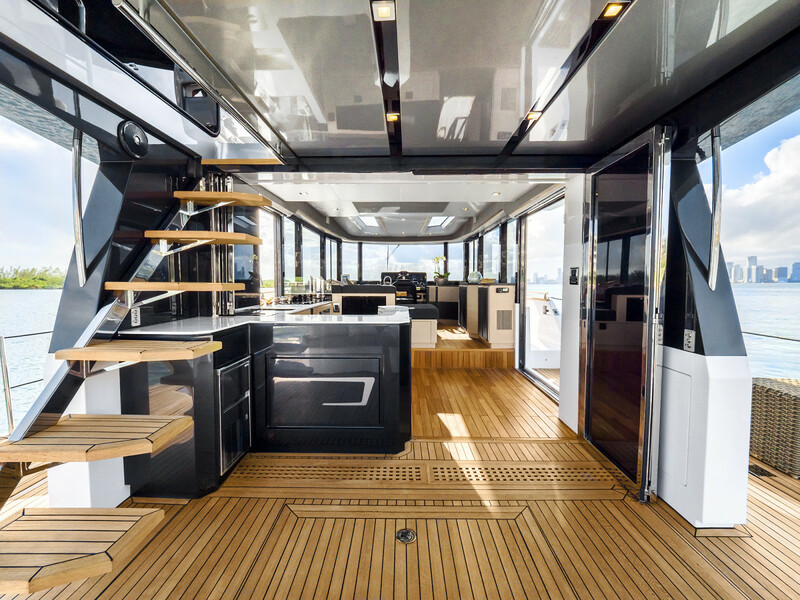 Through connections that he had made within the Italian yacht design community, he chose to work with Milanese designer Paolo Ferragni. 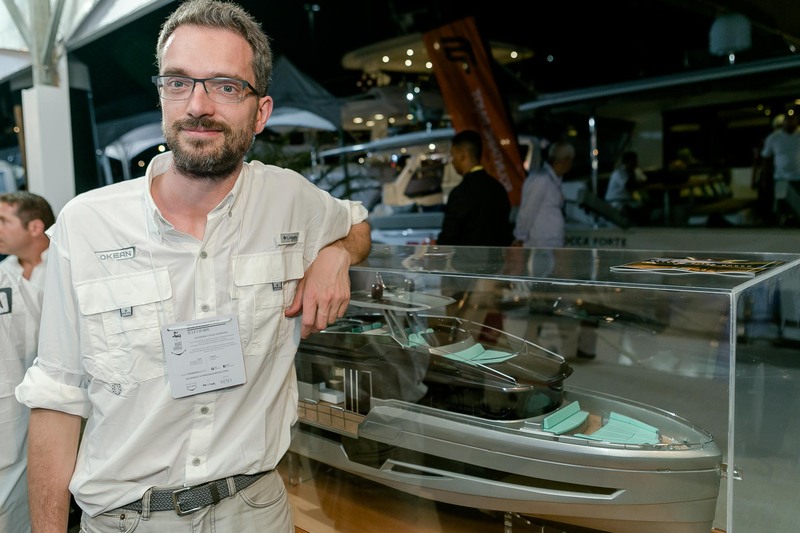 Ferragni’s design studio has developed recreational boats for builders and owners throughout Europe for 15 years. 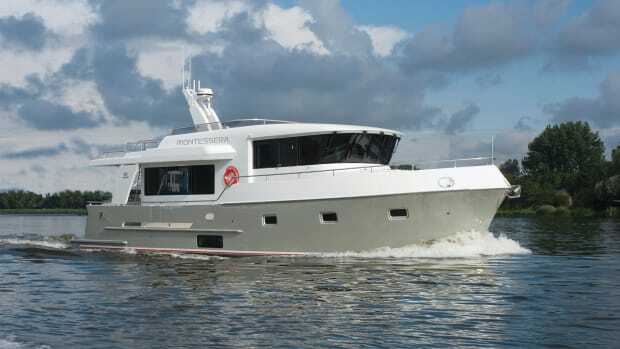 The design objective for the new line was to create a series of innovative yachts from 50 to 80 feet, built to CE standards with a Category B rating (Offshore: includes boats operating offshore with winds to 40 knots and significant seas to 13 feet). They wanted a hull design that provided equal performance at both displacement and planing speeds, a unique open concept, and a high-quality, contemporary interior. In addition to the 50-foot model, there is an 80-foot version nearing completion, a 66-foot version currently in the design phase, and a 53-foot open dayboat under consideration. They are currently working on a backlog of 10 vessels to be completed by late 2018. The 50 tested here was hull #2. 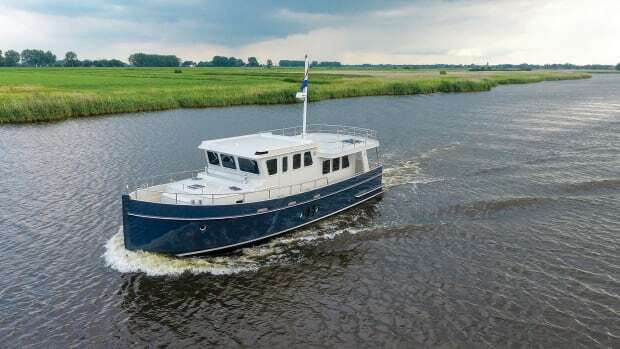 Because of Fernandes’ experience working with HMY Yachts, he brought them onto the project team to advise on marketing and construction details. 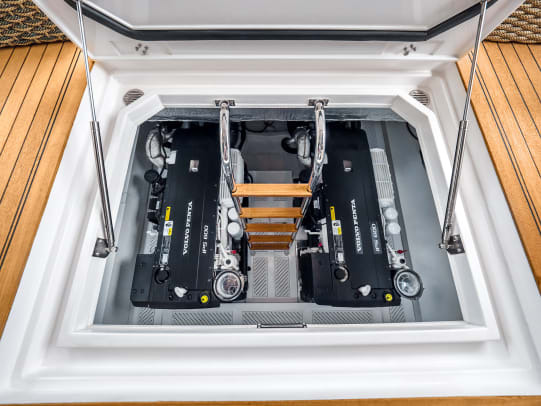 HMY was charged with overseeing the use of as many U.S. components as possible and making sure that the whole line they offered was U.S.-friendly, including layout, finish, and many other details that concern boaters in the States. 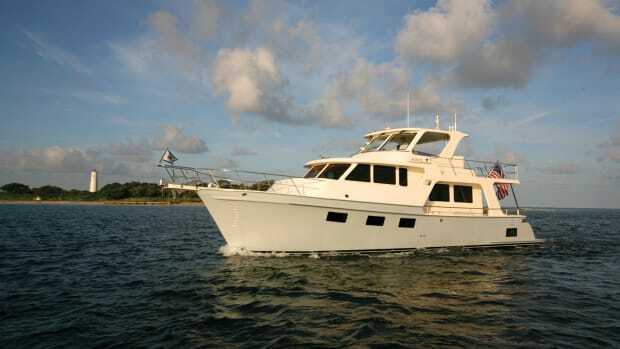 In business for almost 40 years, HMY has become one of the largest yacht dealers in the country. With HMY’s Arthur Grin as the project coordinator, HMY will not only be making source recommendations and providing worldwide marketing but also coordinating all service and warranty performance. The Okean 50 with her port and starboard balconies open. It was easy to spot the Okean 50 in the marina as its portside balcony was open, creating easy boarding from the fixed dock. 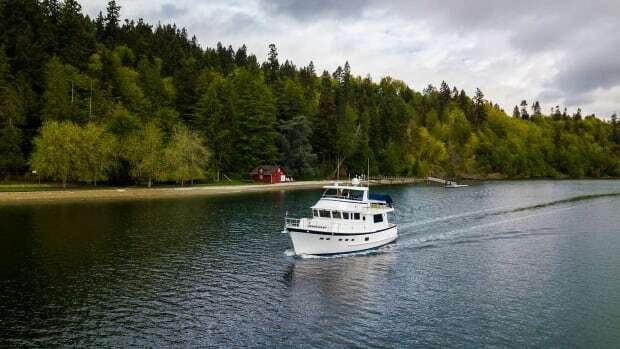 As I stepped on, I thought how impressive it would be to be anchored out with both balconies deployed creating over 200 square feet of additional open deck space. 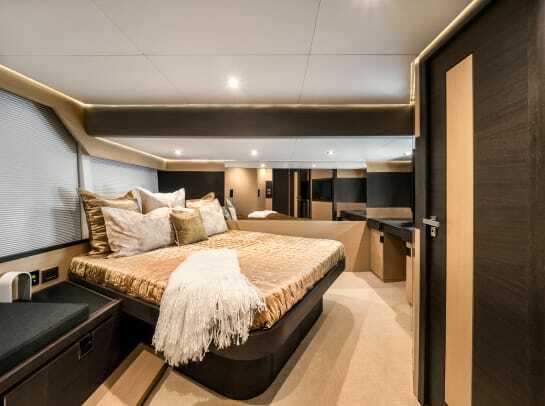 The sense of space is further enhanced by double sliding glass doors on the starboard side that disappear into the cabin side, a double-hinged door at the after end of the saloon, and an open bar into the galley to port. The balconies are deployed by concealed hydraulic lifts and supported by a full-length deck hinge with stainless wire supports on the forward end. A push on the button silently raises them to become the after bulkhead on each side. When viewed from the stern, the opened deck combined with the glass-enclosed saloon created a three-dimensional aura unlike any I had ever experienced on a boat. The Okean 50 sports twin IPS600 Volvos. Captain Alex Faga eased the Okean 50 out of the slip into a tight fairway for our test just as the first ocean-borne squall brought rain and wind from off our bow. HMY’s Arthur Grin and I watched as he deftly manipulated the joystick controlling the twin IPS600 Volvos. Small movements allowed Faga to effortlessly spin the boat in its own length. The complete absence of window frames provides great visibility to the person at the helm, even in spitting rain. The 180-degree windscreen, radiused on both sides, has enough straight surface in the center to allow one large windscreen wiper to provide about three feet of effective sweep. We were limited to sections of the inland waterways without wake restrictions for our testing due to the condition of the ocean. The ride was, of course, smooth as there were no waves. But a few large wakes from other passing boats did give us a chance to appreciate the internal gyro keeping us level at all times. 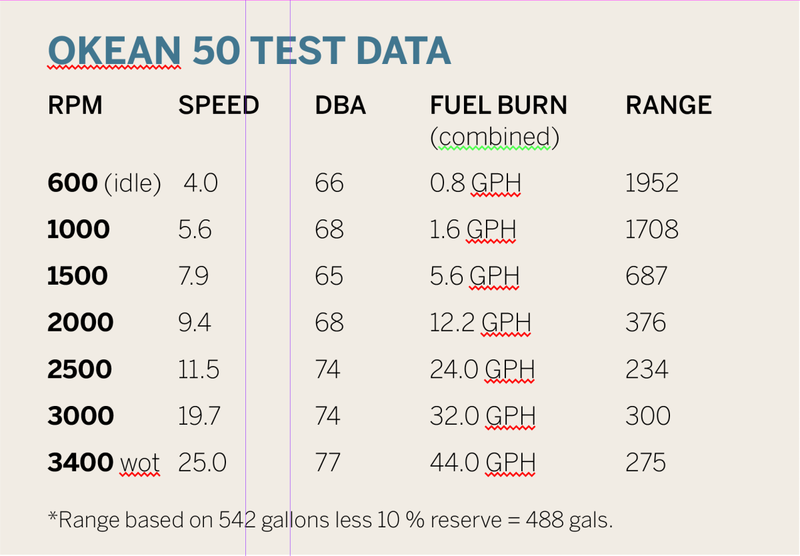 The decibel readings at all speeds were in very comfortable ranges (see test data), and the boat responded well to all maneuvers driven by the pod drives. 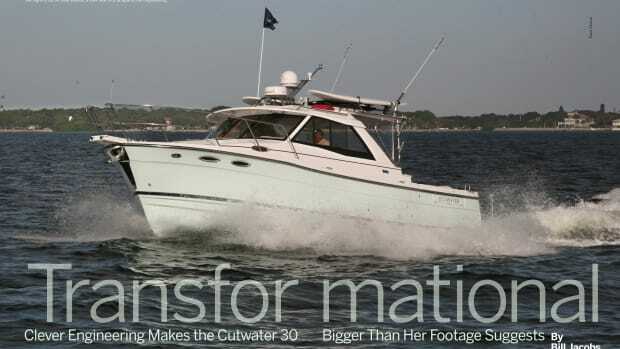 As we ran the boat from dead idle speed to wide open throttle, the acceleration was smooth, even as we transitioned from nine-knot trawler speed to a brisk and comfortable 20-knot planing speed. The difference in range between these two comfortable speeds was only 76 miles, or about 20%. The numbers bore out one of the principal objectives behind the Okean 50—good performance at displacement and planing speeds. 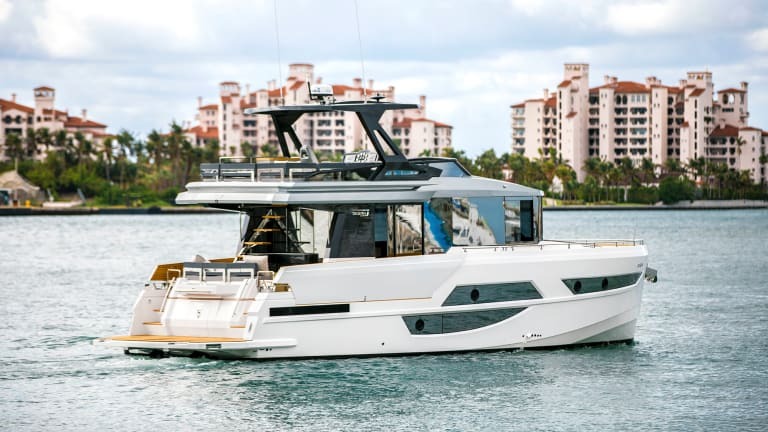 Ferragni utilizes what he refers to as a “Duo Mode” hull design, which is his take on a semi-displacement hull with lifting strakes forward and a 14-degree deadrise in the stern. 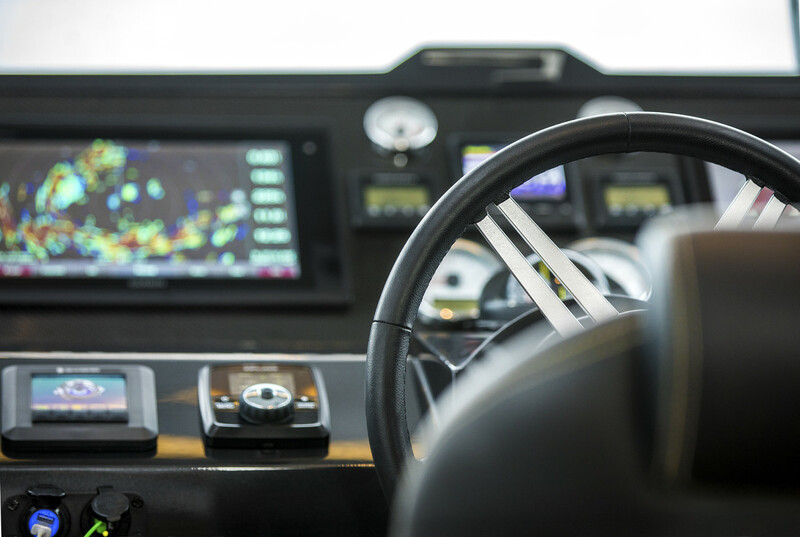 The helm connects the skipper to the data on the water via the bevy of electronics and the glass expanse provides a tactile presence with incredible visibility. Our test run complete, we returned to the dock with the same ease as our departure. It was interesting to note that once Captain Alex Faga secured us to the dock on our port side, Arthur Grin pushed a button and lowered the port balcony. There was plenty of clearance in what appeared to be a standard width slip of 18 to 20 feet. Stepping back ashore was a breeze. After a quick lunch I went back aboard to tour the boat. All the saloon glass is able to be covered by slim aluminum blinds hidden in a valance. An interesting option might be electrically operated blinds. The compact galley is well located and sufficient for entertaining, but could use additional counter space and refrigeration (the latter common on vessels designed in Europe). Grin had explained that this will be addressed in future builds. The detailing, use of materials, and quality of finish are right out of a Milan design studio. And the quality is unmistakable. The only use of vinyl in the interior is the headliner. Otherwise, stitched leather, wood, recessed LED lighting, and stainless steel hardware abound. This boat featured a neutral color palette throughout, which I thought was perfect for the contemporary concept. Grin told me that there are two other color palettes available and additional flooring options as well. Part of his responsibility was to source almost all of the interior appliances, controls, and mechanical components from U.S. sources or readily available international distribution. The three-stateroom layout includes a midship master, a forward VIP cabin, and a portside cabin that is equipped with bunk beds. An office option and other requests for custom touches can also be accommodated. Large glass hull windows in all cabins allow great amounts of natural light throughout. There are two full heads that are spacious and well lit. The engine room is accessible from a large deck hatch on a hydraulic lift, down a steep but manageable ladder into a commodious engine bay. The twin Volvo IPS600 diesels looked as tidy as under the hood of a brand-new Mercedes. Gone are myriad runs of hoses and wires; here, everything is neatly contained in logical runs. The water manifold on the port side was as neat an installation of services I’ve seen. The forward side of the engine room holds a powerful Onan 13.5 kW generator, which powers six separate A/C units totaling 74,000 BTU. Both engine water intakes are very accessible nearby. There is a large lazarette astern accessible from a hatch above and a door to the swim platform. This boat had a compact washer/dryer located within, but future boats will move this unit to inside the forward corridor. 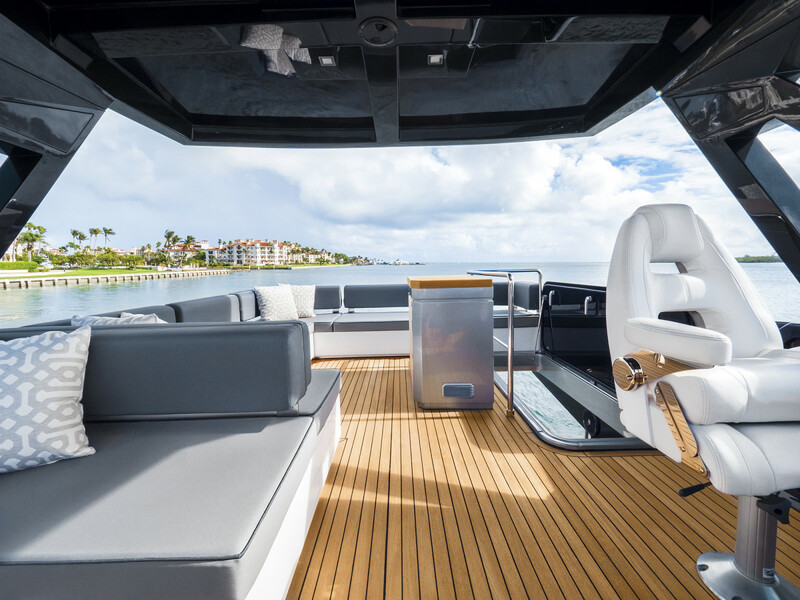 The flying bridge has a second helm station and large U-shaped settee, both covered by an optional carbon fiber hardtop. It was open with no canvas, which I think was appropriate as the main helm below provides such great visibility. The entire hull is laminated with biaxial fiberglass over a Divinycell foam core infused with vinylester resin. 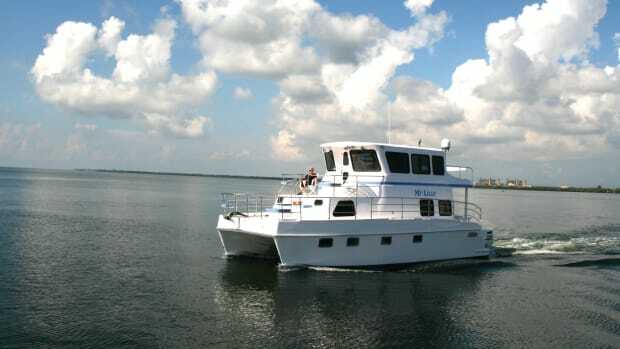 The main deck and its balconies are all teak-surfaced, but fiberglass nonskid is an option. Up forward, the vertical windlass drops a polished stainless steel Bruce anchor on a 50-foot chain and 200-foot line rode. Twin deck hatches open to an immense anchor locker. Future builds will include a dedicated rode box, allowing extra storage for fenders. 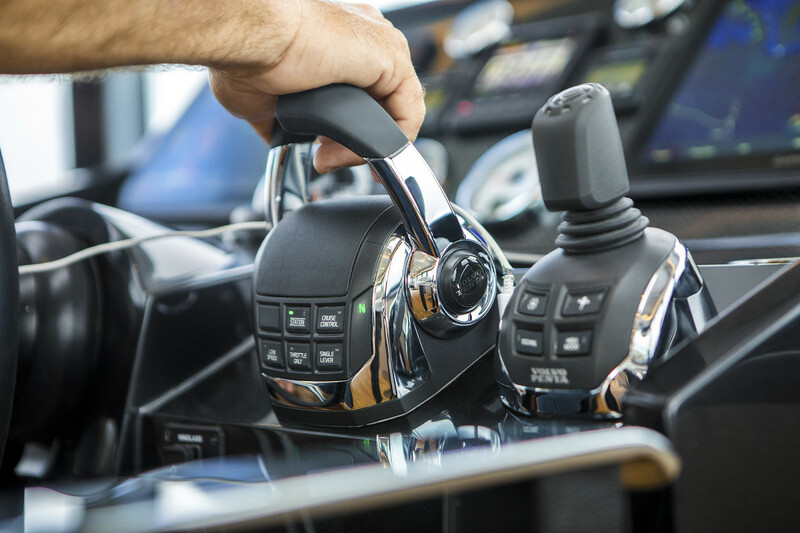 Included in the price are dual Garmin displays at both helm stations, a 50-inch LED TV on a hydraulic lift in the saloon, and 24-inch TVs in both staterooms. 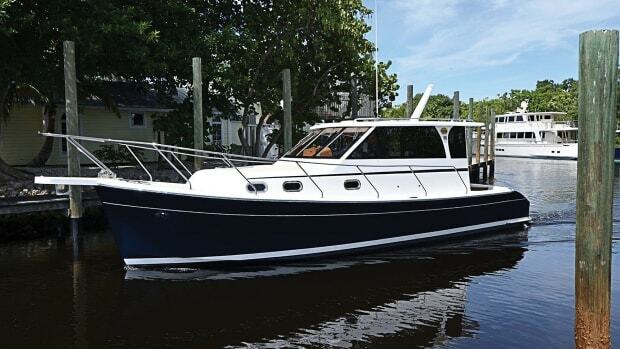 So where does the Okean 50 fit in the world of power cruisers and trawlers? Frankly, it can fit anywhere you want it to. It is a unique expression of voyaging under power. It certainly falls on the contemporary side of design, but its ability to perform well at both displacement and planing speeds, its oceangoing Category B status, and its unique indoor/outdoor configuration may also prove of great interest to the general market. 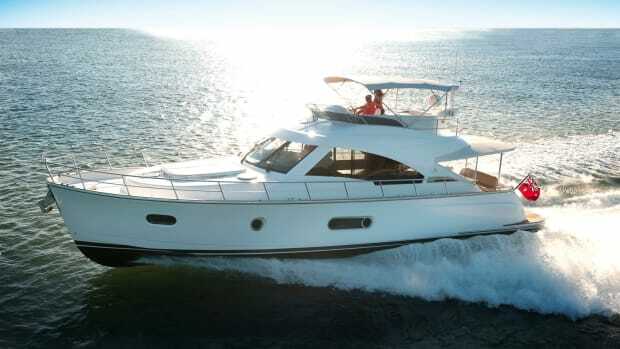 For more information on the Okean 50 contact HMY Yachts.